Zimbabwe’s landmines were laid during the Liberation War of Independence of the 1970’s by the army of Rhodesia (as Zimbabwe was then known). The Rhodesian military created lethal barriers along the border to Zambia and Mozambique to keep liberation forces at bay. Zimbabwe inherited over a million landmines, laid by Rhodesian security forces during the liberation war. These are in stretches of minefields, covering over 700 kms along the Zambian and Mozambican borders that were laid to prevent enemy movement in and out of the country. Efforts to clear these mines began in 1980, but so far have covered only a fraction. They run mostly as very dense belts alongside communal lands, where fencing and warning signs have largely been destroyed with devastating results. These border minefields are some of the most mine-impacted areas in the world with about 5,500 landmines per kilometer at some border minefields. However other areas nearer to towns and villages are also suspected of low-level landmine contamination, and the mines effectively render vast tracts of land off-limits. As well as the tragic accidents that inevitable occur, local communities are also unable to access basic needs such as prime farming land, paths and market routes, and expansion of residential and business areas, and sustaining a perpetual cycle of poverty. The deadly landmines lie inside what is now the Great Limpopo Transfrontier Park (GLTP), the largest conservation area in the world, spanning South Africa, Mozambique and Zimbabwe. The landmines have remained in place for four decades and cause a serious threat to already endangered wildlife such as elephants and lions, as well as local communities who desperately need the land for grazing and agriculture. Landmines and wildlife do not mix. Animals cannot read ‘danger’ signposts and unknowingly surrounded by landmines, accidents inevitably occur. 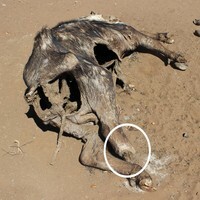 For elephants, buffaloes and lions, this means the loss of a limb followed by a slow, painful death. Smaller animals die instantly. The minefield runs for 37km with an average width of 75 meters, and has one of the highest landmine densities in the world (about 5,500 mines per km). This huge lethal barrier could also have a long-term impact on the gene pool of species such as the African elephant. Gonarezhou National Park boasts a population of over 11,000 African elephants, one of the largest in Africa. Kruger National Park also has a similar sized population. Given the general continental decline of the African elephant, it is paramount for the long-term wellbeing of the species that these two healthy populations have safe access to interaction. While there is evidence that some elephants from Kruger National Park have made it to Gonarezhou National Park, the majority of elephants have learned to stay away from the barrier. The landmines also scare away safari operators and lucrative, conservation-focused ecotourism. 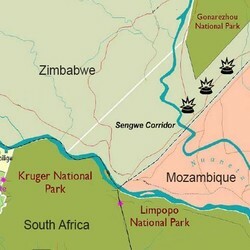 Kruger National Park receives a massive influx of tourists (over 1,600,000 a year), which could potentially travel up the Sengwe Corridor and into Gonarezhou National Park without requiring a visa or leaving the conservation area. Currently Gonarezhou National Park receives virtually no international tourists. If even a small fraction of the Kruger National Park tourists made it to Gonarezhou National Park, the economic implications for Zimbabwe would be significant. APOPO's Program Manager Alessandra Broli arrived in the country in September 2017 and is busy preparing the project and fundraising. APOPO will begin the project using conventional demining methods (survey, metal detectors and machines) and aim to bring in the mine detection rats at a later stage after government approval. We are working as fast as we can on setting up the project and hope to be operational in 2018.